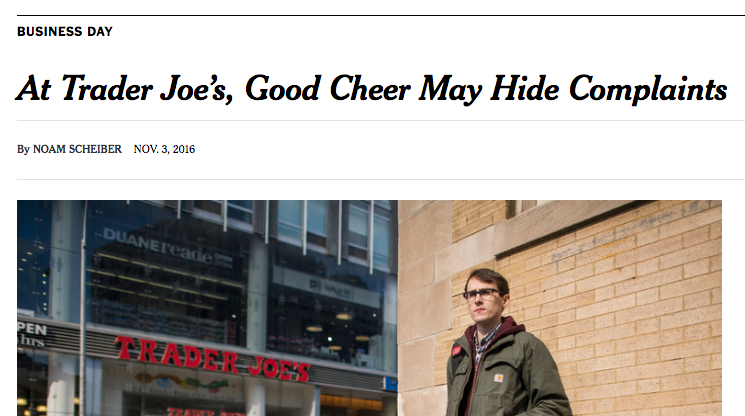 Is the good ship Trader Joe's changing course? 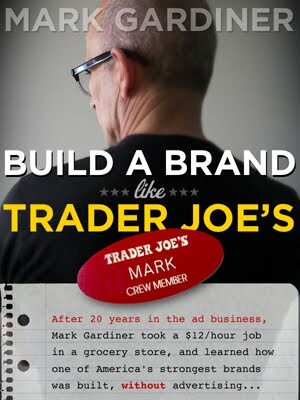 That was a question I asked at the conclusion of my 2012 book, "Build a Brand Like Trader Joe's". Just around the time I was leaving the company, TJ's head office announced changes to the management 'track' that caused quite a few full-time employees to quit. And they changed the way Crew Members were evaluated, in subtle ways that I thought reduced the rewards for truly exceptional employees. At the time, I noted that it was a big company and it would take a long time before customers might see the effects of such changes. One thing that's interesting about this story is that in New York, especially, customers are almost as likely to hate Trader Joe's famously chatty approach to customer service as they are to appreciate it. Half the comments readers posted amounted to, "I wish they'd shut up, anyway." I'm inclined to believe the employee, Thomas Nagle (seen above). In TJ's limited defense however, the entire brand's been built around a certain kind of employee-customer interaction. Employees who aren't cut out for that kind of interaction should probably not have been hired in the first place. Are you a regular TJ's shopper? What do you think? Has customer service suffered at the chain over the last five years or so? Over the last couple of weeks, a story's gone viral about Trader Joe's (perhaps) introducing a sweeping set of price cuts. Aggregators like Business Insider and slightly more reputable sources like Fortune picked up this story, which originated with a quick research trip by an investment analyst for Deutsche Bank. The analyst did a "cart comparison" of 77 grocery items, purchased at Whole Foods and TJ's. Apparently an earlier comparison found TJ's 15% cheaper, while the more recent check showed TJ's to be 26% cheaper. The reason an investment analyst would do this in the first place is, Whole Foods is a publicly traded company. 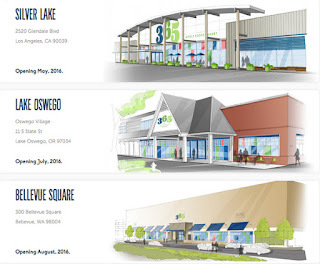 Investors are curious about Whole Foods strategy going forward, including plans to spin off a new smaller grocery store concept that seems to be a more direct competitor to Trader Joe's. Right off the top of my head, I can think of two reasons to question the simplistic conclusion that TJ's is dropping prices. The first has to do with the design of this experiment: if Deutsche Bank wanted to determine whether TJ's was lowering prices, the way to do that would be to compare a current TJ's 'basket' with an earlier identical selection of goods. They didn't do that; they just used Whole Foods as a benchmark. Nothing I've read points specifically to TJ's lowering prices, as opposed to Whole Foods raising them. And, they noted that the price disparity was greatest in produce. While I'm a big fan of TJ's as a company and a brand—and while I'm no fan of Whole Foods—no grocery expert would ever say that comparing TJ's produce to Whole Paycheck's was an apples-to-apples comparison. Produce is a TJ's weak point, and a Whole Foods strong point. Meanwhile, if there are any current Trader Joe's employees who want to weigh in on the "price drop" story, feel free to contact me through this web site. I'd love your insights. Whole Foods stock has taken a pounding over the last year or two. Same store sales have fallen, as lower-price rivals from Costco to Walmart have increased their organic food offerings. Whole Foods was also hurt by a weights-and-pricing scandal that added insult to the injury of already-high prices. The company's responded to increased competition by launching a new line of smaller stores, called '365', that are plainly modeled on Trader Joe's. 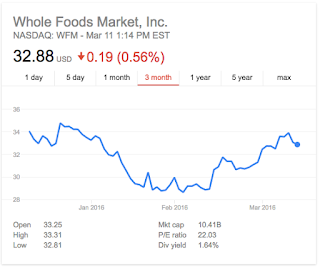 While the stock (NASDAQ: WFM) has climbed about 10% so far in 2016, it's still trading near a 5-year low. So is this a good time to buy in? 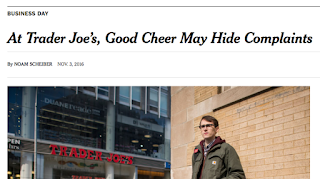 Maybe, but as an afficionado of the Trader Joe's business model, I'm put off by Whole Foods' recent announcement that it was going to cut 1,500 jobs. Trader Joe's outperforms in the grocery category in large measure because it is way overstaffed, by the standards of typical market.